This weekend I had a request from my cousin, Michael, for some Christmas cards that he could send to the parents of his exchange student friends who are staying with him. They are from Japan and right away I thought of my Sister Stamps stash. The way we stampers tend to accumulate new stamps it is easy to always be using the new, new, new! I know I fall into that all the time, so it makes it even sweeter when I revisit old favorites. This fun stamp is called Shimo San and in order to keep the card nice and flat for mailing I decided to go ahead and color in a winter background for them to inhabit. I also just got my hands on some Curious Metallics Cryogen White cardstock to see what it was like to color on and I gotta say, I LOVE it! The Copic ink goes on so smooth, blending beautifully and the cardstock has a subtle iridescent shimmer to it that makes the finished card positively sparkle and shine. I wish the photo captured the magic of this cardstock because it is so pretty in person. 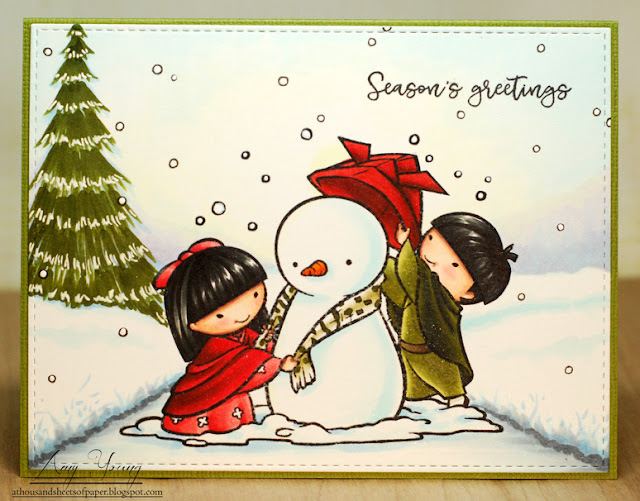 Well I hope Michael likes this card as much as I do because I had a blast coloring up these winter kiddos once again. So excited to see you use a Sister Stamp, miss them. Adorbs. I’ve been going through some unused stamps I have in my stash, it’s like Christmas. Hugs. AWE so Adorable!!! Love the old stamps...It kills me when I see people always doing destashes.....I could not destash....It's fun mixing old stuff with new and always having an stamp for that perfect occasion that you don't have to go and buy just for a certain project...you never know when you really need an older stamp...I know you have to make room but I don't go hog wild and buy every new stamp out there by every company unless it's a Mermaid!!! lol lol which sadly I am still missing a few of those too.... Have an Awesome day doll!